The first residents of the area which we now know as the Corsair Ski Trails were the Sauk Native Americans. Their prehistoric ancestors presumably arrived in this area during the Borea-Archaic culture period, approximately 2,000 to 5,000 years ago. In more recent times, the loss of a major battle with the neighboring Chippewas and Ottawas, possibly at the present site of Oscoda, banished the few remaining Sauks west of the Mississippi River. This land thus became the common hunting ground of the Chippewa and Ottawas, and they enjoyed a peaceful existence for several more centuries. According to Indian Legend, a terrible wind one day swept through the area uprooting trees and leaving great devastation in it’s path. The Indians felt that the Great Spirit had shown His/Her displeasure. They named this area Kanotin, meaning “In The Path Of The Big Wind”. They avoided this area, after the great storm, for many years. At some time after the great storm, an equally devastating flash fire raged through the fallen timber and burned away all traces of the once magnificent forest. All that remained was barren land; it’s light soil giving root to occasional pine trees and vast patches of blueberries. This sparse area became known as “The Plains”, and when the lumbermen settled this county in the 1850's, the Plains were considered a vast wasteland. However, a colorful chapter in early Iosco County history was enacted in this region when an attempt was once made to cultivate the pine Plains into farm land. Unfortunately, failure and defeat were the results. Today, after a lapse of 135 years, the farming community that once existed in the present location of the Corsair Ski Trails is long forgotten, virtually unknown, and has become the “ghost” community of The Plains. The pioneer homesteader of the Plains region was Samuel W. Chilson, who located at the head waters of Silver Creek in 1864. Personal business often beckoned Mr. Chilson to Saginaw and he would travel there on foot. While visiting downstate, he would tell all who would listen about the land in Iosco County that could be easily cleared and was open for homesteading. His colorful stories were successful in encouraging early immigration to the Plains area. Perhaps the most unusual of these settlers was Elizabeth Bruce, an 80 year old widow who took up a homestead on 160 acres. Place names in the vicinity of the ski trails memorialize some of the early settlers. Gray Creek ran through Enos Gray’s farm; Stanton Creek received it’s name from Addison Stanton; While Gordon Creek honors John Gordon. Wright’s Lake was located on the Lester Wright farm, and Corsair Bridge, over Silver Creek, was for the convenience of the families of Harvey and Ira Courser, whose rustic log homesteads were located there. In the early days the crossing was only a beaver dam; in later years when the Thompson Trail was developed, a bridge was constructed over the dam. In 1931 the present Monument Road was constructed as a direct route to the Lumberman’s Memorial Monument, erected in 1932 on the Highbanks of the AuSable River. Much of the remaining Thompson Trail is known today as Trout Road. A unique wilderness hotel served the transient trade of lumbermen who regularly passed through the Plains region. The Schad House Hotel, located on the Thompson Trail, two miles northwest of Corsair Trails, was constructed by William Schad, who owned and operated the inn for many years. The first floor was divided into three rooms. Named in order of their importance, they were: bar room, kitchen and dining room. Guest rooms occupied the second floor. The Schad House flourished and existed for many years after the last Plains settler abandoned his farm and moved onward. Until 1885, the Schad House served as a halfway house for the lumbermen and teamsters traveling and hauling supplies inland to the logging camps. Often 50 or more lunches would be served daily to those itinerate travelers. Public dances and suppers at the Schad House were gala events that attracted revelers for many miles. Lumbermen attended from the AuSable River camps and townspeople would travel from Tawas over slab roads and the rough winding Thompson Trail. Historical records chronicle a murder on the dance floor of the Schad House, committed by a jealous husband, at a Thanksgiving Dance in 1880. The unfortunate victim was buried in the long forgotten community cemetery, located one mile west of the Corsair Trails. The romance of the pioneer era was enacted in the Plains region. Virtually every home in the community was a log cabin. Wheat, corn, rye, vegetables of all kinds, and fruit trees once grew where ski trails now pass. The “largest farm of the Plains” belonged to Enos Gray. He would annually plant 20 acres of potatoes along Gray Creek. Oxen were the chosen beasts of burden, and took the place of the horse on the Plains farm. A farmer who owned a team of plow horses was considered wealthy. Cattle were rare on the Plains. They were very expensive due to the excessive transportation fees incurred in shipping cattle to Iosco County via Great Lakes sailing schooners. Development of the Northeast Michigan shoreline communities was handicapped by the lack of overland transportation. The area could only be reached by boat until Green’s Stage Coach Line developed a route from Standish to Alpena in 1871. The DBC&A Railroad did not arrive until 1883. During the early years, school was held in the Anson Abbot home, a “large” 24’x36’ log cabin. Later, a one-room schoolhouse of frame construction, painted white, and featuring a modest library was constructed, near the present corner of Monument and Shellenbarger Road. Annually, 15 to 20 students would attend school, which was only conducted during the summer term. Early religious services in the Plains region were held in the schoolhouse. Itinerate preachers brought the gospel to the early settlers, and they were openly welcomed regardless of sect. Plains farming existed for 10-15 years, but never proved profitable. Why did Plains farming fail? Simply stated, the soil was too light. The Plains soil was basically of sand composition and had little, if any, vegetable matter. It would have needed barnyard fertilizer to make it productive. As mentioned earlier, cattle were rare on the Plains farms because of their high expense. As a result, the light sandy soil could not hold enough moisture to support a thick healthy crop. One by one, the early settlers abandoned their property and in 1877 the last Plains settler moved East to the fertile soil of Wilber Township. The story of the Plains farmers grows in beauty as it fades in the darkness of the past. Life was not so complex then, as now, and pleasures were derived from simple things. As we glide our skis across the winter trails of Corsair, Wright’s Lake, and Silver Valley, let us imagine the hearty Plains farmers who snuggled around a roaring wood fire, “shut in from the outside world”, anticipating the arrival of spring and the blossoming of wildflowers along the woodland paths. Perhaps some of the same paths we utilize today as we also enjoy the serenity of this special land. The State of Michigan fielded 11 Regiments of Cavalry during the Civil War. Four of these Regiments were brigaded together to form the famous Michigan Cavalry Brigade, led by the colorful and flambouyant Brigadier General George Armstrong Custer of Monroe, Michigan. At the conclusion of the war some of these regiments were kept in Federal service, against their will, to suppress the Indian uprisings in the West. One of the veterans of the Michigan Cavalry Brigade became an early Iosco County settler, and is buried in Silver Valley. Frank Eaton was the son-in-law of Harvey and Eliza Courser, whose pioneer homestead once stood at the location of the present day Corsair Ski Trails. The Courser family, and Eaton, were originally residents of New York state. In 1859, the 22 year old Frank Eaton married 13 year old Mary Courser. The following year, their first child, daughter Mary, was born. In 1862, the Courser and Eaton families moved west to Comstock, Michigan. 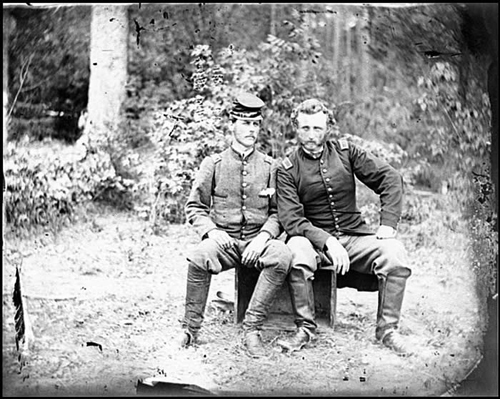 At the end of February 1865, the Michigan Brigade, with Frank M. Eaton in rank, formed a part of the force with which General Sheridan made his movement against General Early's Confederate army, and on the communication lines in the direction of Gordonsville and Richmond. On the 8th of March, they participated in a battle with a part of the Confederate cavalry, under General Rosser, near Louisa Court House, and assisted in routing them, and capturing the town, which contained large stores of supplies sorely needed by the men with General Lee. The Brigade reached White House Landing in time to take part in the final battles with the Army of the Potomac. They engaged the Confederates at Five Forks on April 1st, South Side Railroad on the 2nd, followed by Duck Pond Mills, Sailor's Creek, and then Appomatox on the 9th. After the surrender of Lee, the Brigade, under the command of Colonel Stagg, moved via Petersburg into North Carolina for a short time, then to Washington, where they participated in the Grand Review on the 23rd of May. 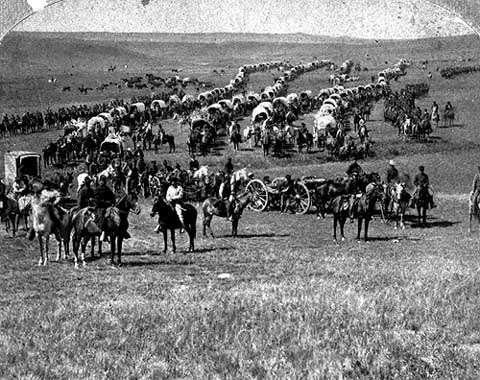 Immediately afterwards, the Michigan Brigade was ordered West, proceeding via railroad and riverboats to Fort Leavenworth, Kansas, where the 5th and portions of the other regiments were mustered out of service. From there they were ordered to proceed farther west to suppress the war then being waged by several Indian tribes. After seeing service throughout the Dakota's and Montana, the regiments were consolidated into what was to be known as the 1st Michigan Veteran Cavalry. The Brigade was improperly retained in service until March 10, 1866. After many protests about the men being held illegally in Federal service - after they had already been mustered out - they were allowed to return to their homes. 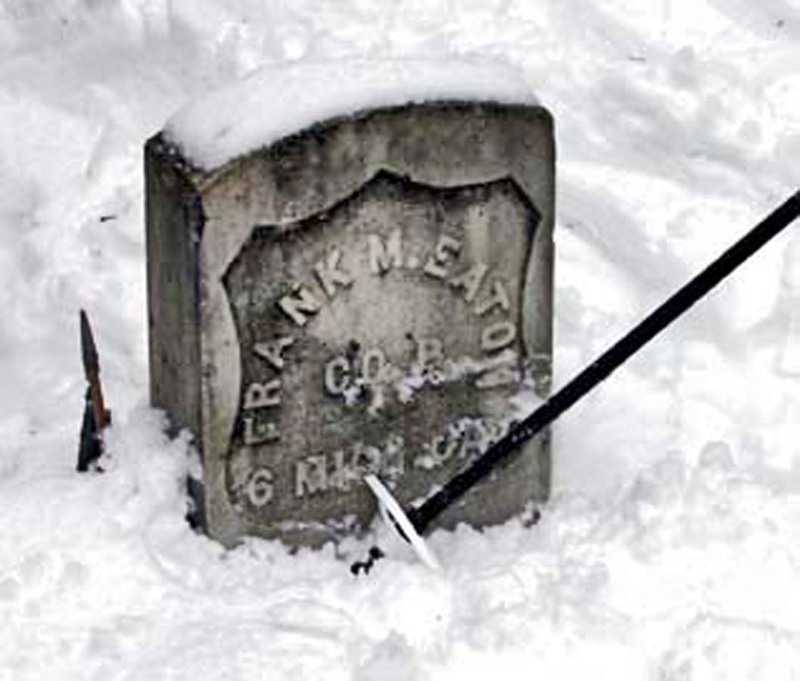 Frank M. Eaton was discharged at Salt Lake City, in the Utah Territory, on February 22, 1866. After his military discharge, Frank Eaton returned to Michigan. Moving north to Iosco County, Frank and his wife, Mary, peacefully homesteaded and farmed next to his relatives, Harvey & Eliza Courser, and Ira & Lorina Courser, along Silver Creek. On February 19th, 1870, the temperature was cold, and the ground was covered with a blanket of snow. Frank and his relatives were cutting firewood in Plainfield Township, north of Round Lake. A large tree was felled, and Frank Eaton was accidentally struck and pinned by the falling timber. The blow was fatal. County records indicate Frank Eaton's age was 33 years, 2 months at the time of his unfortunate death. In the U.S. Census of 1870, Mary Eaton listed her age as 24 years. She indicated that she was a widow, "keeping house" for herself and four children: Mary -age 10, Jay -age 7, Francis -age 3, and William -age 2.